The Chic Bargainista®: Loeh•mann•om•ics: Enjoy some Special Coupons and Save! Loeh•mann•om•ics: Enjoy some Special Coupons and Save! Loeh•mann•om•ics is all about getting some fabuless designer deals for less! I recently scored some amazing deals at the new Costa Mesa store, and I want to pass on the savings to readers. 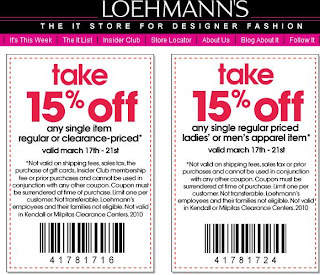 Check out the above coupons for savings of 15% off on items at Loehmann's (check the restrictions on the coupons.) For more info, click here. Let me know what you find!